Trump immigration ombudswoman Julie Kirchner, FAIR, white supremacy, eugenics, forced abortions, and infanticide. 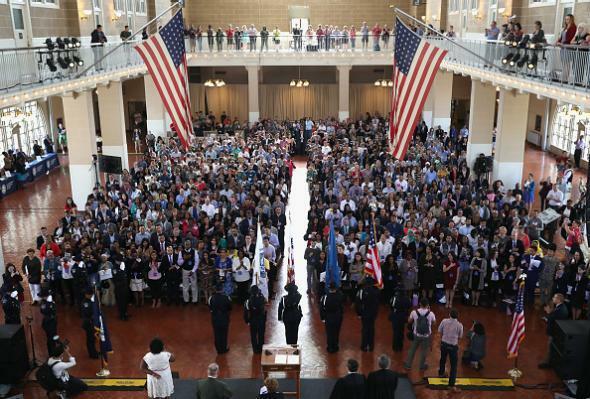 A naturalization ceremony being held on Ellis Island on Sept. 16, 2016. Per a report by ProPublica, former Federation for American Immigration Reform (FAIR) executive director Julie Kirchner will be named the United States’ Citizenship and Immigration Services ombudswoman. Kirchner, in other words, would be the person who individuals in the federal immigration system appeal to for assistance if they need help navigating its bureaucracy or feel that they have been treated unfairly. But her background and FAIR’s history, meanwhile, are characterized by hostility toward immigrants—especially nonwhite, non-Christian ones. Kirchner would be hired to work at FAIR a year later, and Stein named her its executive director in 2007. During her tenure in that role, the group helped create Arizona’s SB170 immigration bill. Much of that law was struck down by the Supreme Court for violating the federal government’s right to regulate immigration, and while SCOTUS didn’t rule on the bill’s controversial provision requiring law enforcement officers to check the documents of anyone suspected of being in the U.S. illegally, that component was largely invalidated by a later legal settlement. FAIR has also campaigned recently to intepret the 14th Amendment in such a way that that individuals born on U.S. soil are not automatically given birthright citizenship. And during the 2016 campaign, Kirchner—then working as a Trump adviser—asserted in a hyperbolic statement provided to Breitbart that Hillary Clinton intended to “provid[e] free health care to millions of refugees,” many of whom could be ISIS terrorists, if elected. In summary, it’s not going to be a good time to be someone with a case before the United States’ Citizenship and Immigration Services office.